Whether you're Ashlee Simpson, Lindsay Lohan, Bijou Phillips or Kimberly Caldwell (American Idol), Anna Chudoba (Average Joe) or Joanie Dodds (America's Next Top Model), you'll look great wearing "My Little Pretty" handcrafted jewelry by Kristy Nuttall. This LA-based designer creates stunning yet reasonably priced, high quality sterling silver pieces. Her use of a myriad of different stones will easily bring out all kinds of moods and personalities as well as match that favorite outfit. "My Little Pretty" has a great range of beautiful earrings, necklaces and bracelets to chose from but I love the Smokey Quartz Necklace shown here. 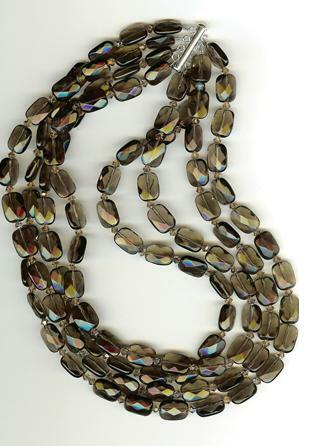 This necklace is made with four strands of beautiful faceted Smokey Quartz stones and light brown Swarovksi crystals. It opens/closes with a sterling silver slide clasp and is approximately 16½ in length. Kristy´s beautiful jewelry is available at a number of boutiques in California and can also be purchased online. And here's some great news, Chic Alert readers! Use discount code MLP_earlybird at checkout when you shop online at My Little Pretty and you will get 25% discount anytime up until November 30, 2006!!! I am searching for a blog post which my http://www.aaacloseoutsnetwork.com/CostumeJewelry.html site is related to, and this one is good. It is well and good that we can share our simple thoughts and services to improve our markets... Nice Blog!